Are you tired of trying to lose weight? Do you need to know someone who can actually help you to get rid of bulky body? If yes, in this article we are going to discuss about none other than Sapna Vyas Patel the famous celebrity fitness trainer who has her name enlisted in the top notch trainers of India. The 29 year old lady was born in 1989, 10th November. She is the beautiful daughter of Health Minister Jay Narayan Vyas. Mostly active on social media website like Twitter, Instagram and Facebook, she also has a own personal channel from where you can get to know more about her. What makes Sapna Vyas patel so beautiful and talented? 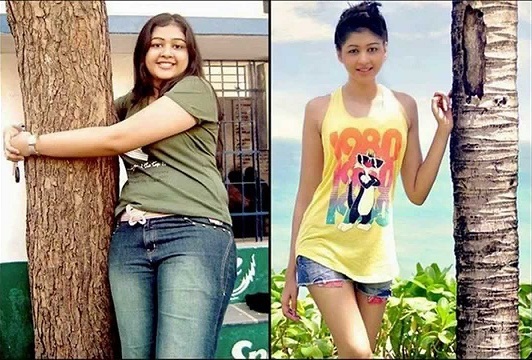 Sapna Vyas lost 33 kg within just one year. Isn’t it great? The epitome of fitness currently weighs around 53 kgs. The main inspiration behind her career was an incident when someone mistakenly to her niece as her own daughter. 19 year old Sapna Vyas was deeply hurt with this remark. That was the time when she decided to lose those extra calories and become a perfectly shaped beauty queen. Who is Sapna Vyas Patel? The certified fitness trainer is rumour to marry into a well-off family residing in Gujarat. She completed her MBA and pursued fitness course. She has been the main limelight of several motivational seminars there she has been seen spreading importance about health and beauty. Many times Sapna has been seen to go live on her Instagram page where she answers the queries of her fans very diligently. People often confuse her to be a part of BJP. Just a few days back, Sapna was felicitated with the leading newspaper Times of India for her excellence in fitness field. What are hobbies of Sapna Vyas? Guess what, the fitness freak loves all the physical activities particularly. She does not follow the current trend when people stick to the Smartphone and develop special liking for smartphones and digital games. Despite being highly active in social media pages, she has her special interest in sports like mountain climbing, swimming and running. Consume green tea at least once in a day. No food after 7 p.m.
Sapna Vyas Patel is currently certified as Reebok fitness professional. She owns personalized website and web application called “stay wow”. Sapna not only lost weight but also created those much required feminine curves. She strictly says that it’s not hard to lose weight as long as you are stubborn and regular. Eat multiple times in a day but in little Quantity. This helps in developing better metabolism and results in lower accumulation of calories in your body. Rely on completely vegetarian diet because consuming non veg foods and extra burden on your digestive system. Meal 1 – green tea / green coffee without sugar. meal 2- make sure that you finish it within 200 calories. Consume low fat milk with oats. Eat 1 plain dosa / 2 idli/ 1 plate vegetable Upma / 2 bread with honey. Meal 3 – make sure that you do not consume more than 200 calories. One bowl of fruit yoghurt without any sugar or milkshake with less sugar. Meal 4 – It should not be not more than 500 calories. Boiled vegetables, pulse, chapati, rice and buttermilk. Alternatively, you can consume paneer, chapati and buttermilk. Meal 5 – should not be more than 200 calories. 1 bowl full of beans or sprouts with lemon, black salt and black pepper dressing. You can spread little gram pulse to make crunchy. 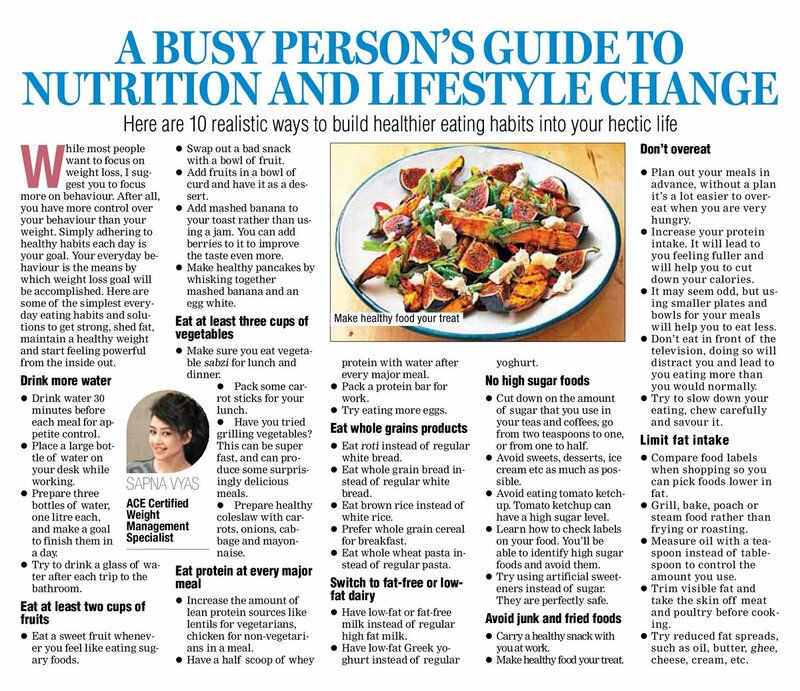 Sapna Vyas Patel advice for busy person to maintain their diet. Sapna has completed her PhD in nutritional science and dietary. Besides being an MBA graduate, she holds a fitness certificate and practices her profession very well. The beautiful fitness trainer has become a role model for everyone in the b-townt. The fitness expert came in the LimeLight when she lost 33 kgs in just one year and assisted more than 5000 people to lead a healthy life by shedding extra weight. The fitness expert has been changed by millions of people on a social media accounts. She is neither a model nor a Bollywood celebrity. Her fans often call her as coach Sapna. The heartthrob of every person who wish to lose weight has an extremely charming personality. You can check out social media pictures where she filing process of followers through her outstanding tattoos, beach pictures, bikini and beautiful dressing sense. The breathtaking pictures of Sapna Vyas Patel are definitely going to turn your crazy for her. On your social media pages, she has been seen to interview various Bollywood celebrities like Anil Kapoor, Milind Soman and other Bollywood stars. Sapna Vyas officially married in a Gujarati family. She keeps her marriage as a secret and does not reveals information about your marital life on social media pages. Unfortunately, we cannot find any information about Sapna Vyas Patel husband for our readers. This Sapna vyas patel wiki give you enough information about her. One thing i missed here is her husband name and it is not revel by her even. Sapna Vyas Patel was 86 kgs when she was just 18 years old. She has her background from a very well of family. Currently she is working as a professional weight trainer and a motivational speaker.